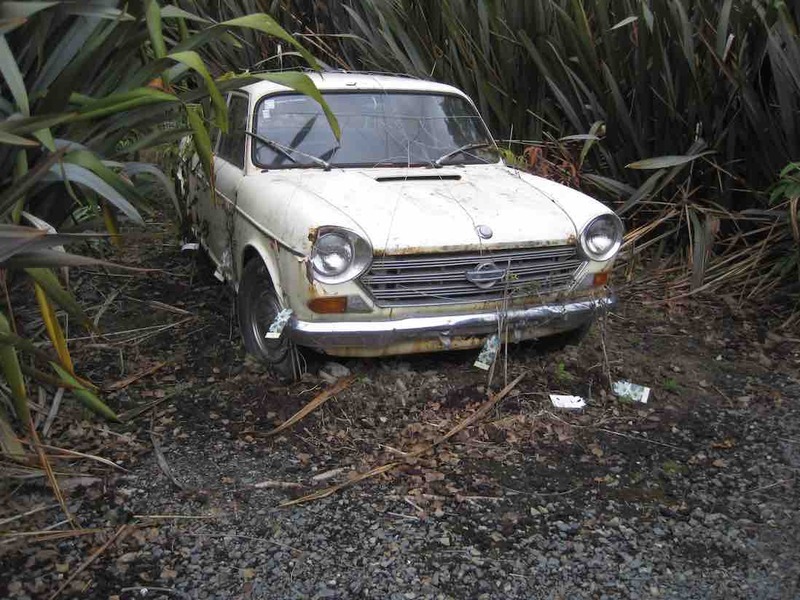 Distance from car-park to Waitati: 34 km. 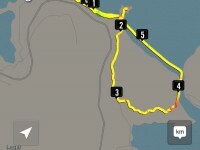 Distance from car-park to Doctors Point: 38 km. 23/01/2019. Hikers. 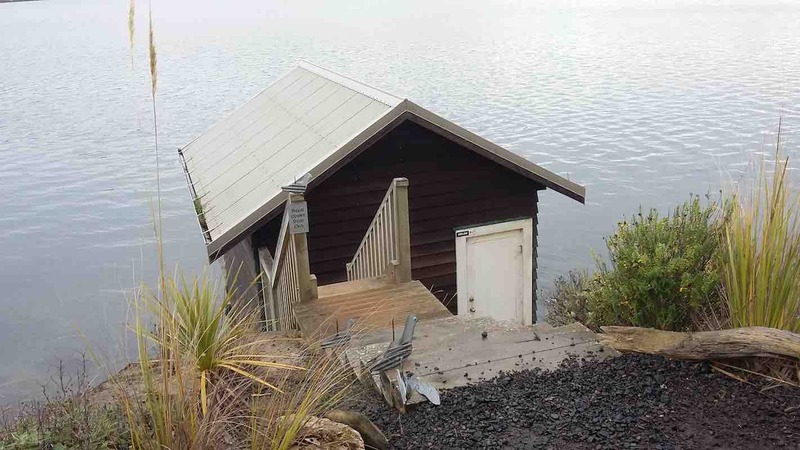 Doctors Point, Canoe Beach, Urupa. E. Leaders: Jim and Betty. showed some amazing changes in the beach with the sand completely stripped away from familiar beach sections and a sand build up in the caves to a height of over a meter. 21. 13/6/2018. Hikers. 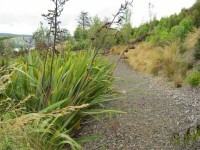 Opeke Track and Orokonui Estuary Track. Leaders: Lesley and Bev. This area is a popular one for the hikers. Especially at this time of the year when weather can be somewhat inclement. This Wednesday was one of those days. Dull and overcast, threatening rain. However, 27 turned out and once again enjoyed a pleasant relatively easy walk. The rain did start after lunch but was really only a misty-like drizzle, so not too unpleasant. 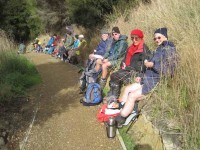 We parked at Blacks Bridge as usual and had our morning tea before we started as it was well after 10am! Walked down Doctors Point Rd to the far end of the Opeke Track then back along the track, enjoying the views and scenery as we went. Were a bit early at the favourite lunch stop but decided just to have an early, leisurely lunch break anyway. 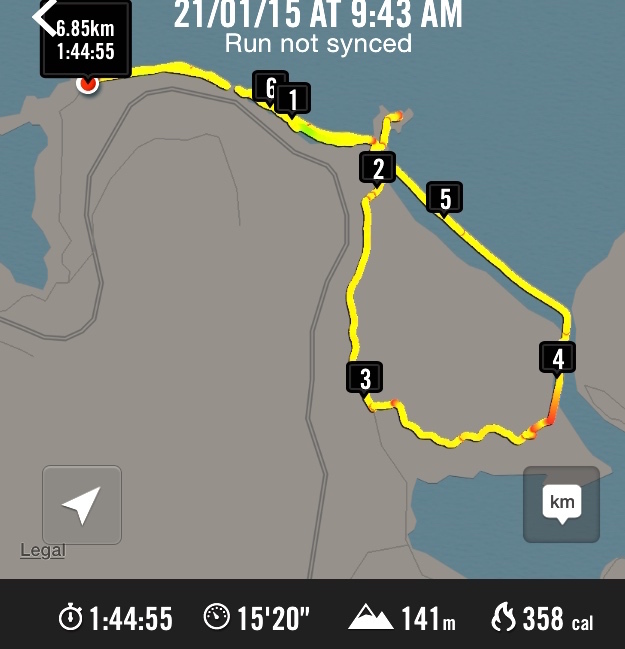 Then it was back along the road, in the the rain, to Chelivode St. and the start of the Estuary Track. We didn’t waste much time walking this track back to the cars as we were getting rather wet. 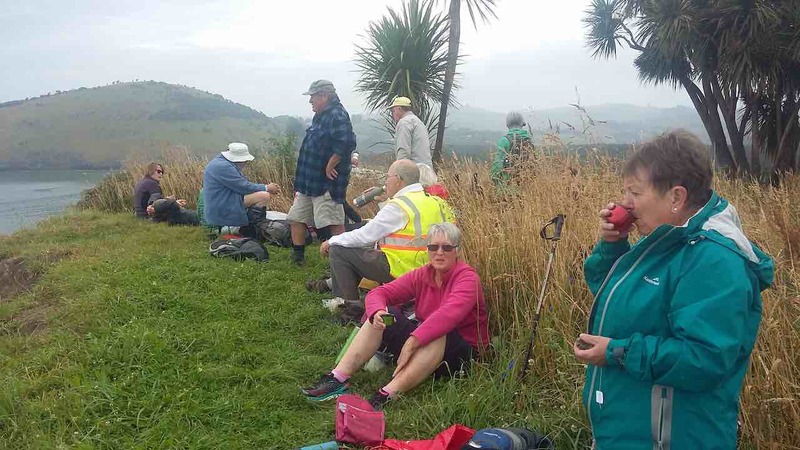 We still enjoyed the bush, birds and views along the way though and everyone said they’d had a good day out in spite of the weather. 20. 2017 Jul 26. Hikers. 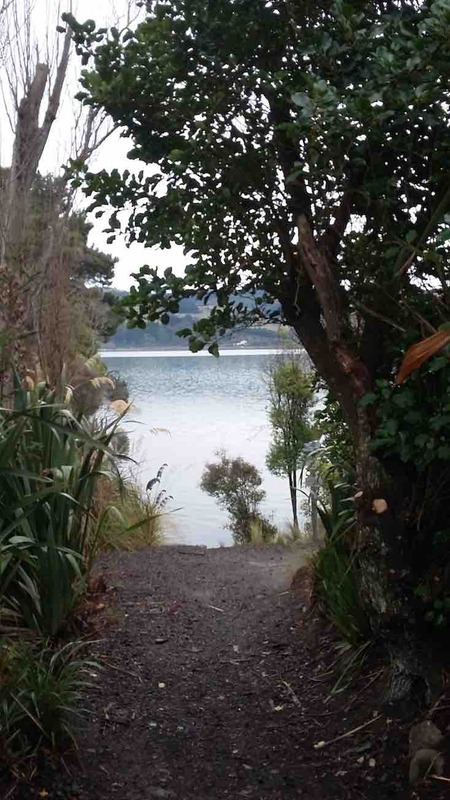 Doctors Point, Canoe Beach, Urupa. E. Leaders: Peter and Wendy. 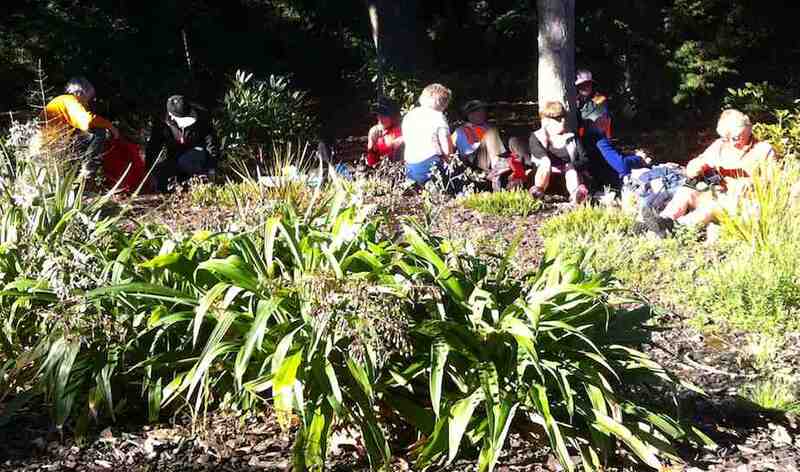 23 hikers reported for duty at the Doctor’s Point carpark on a calm winter’s morning. 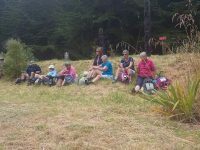 to our morning tea stop at the bottom of Mapoutahi Pa.
Our pathway to Purakaunui Beach was almost blocked by a large tree which had fallen due to the recent floods. Then, as we headed along the track towards Osborne Road we encountered deep water which made us retrace our steps and walk along the beach. 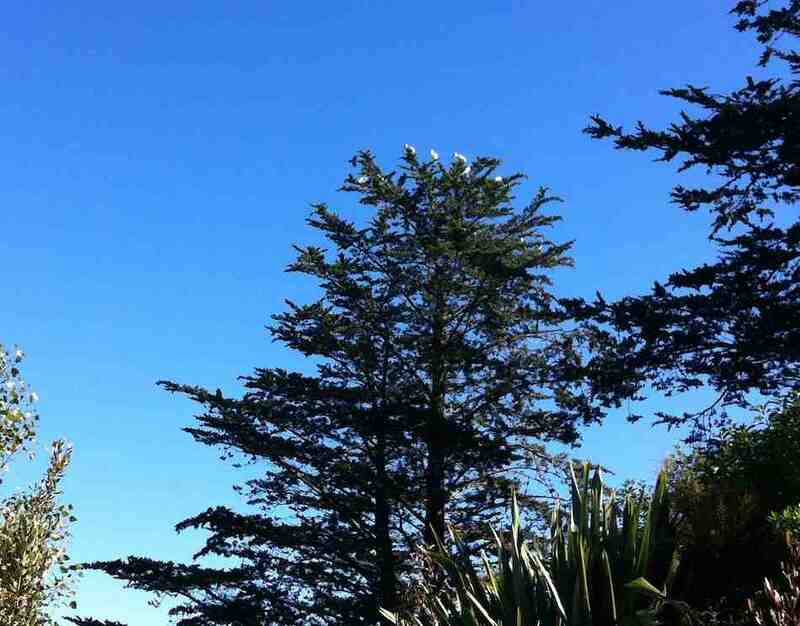 After a pleasant beach walk,we made our way through the trees to the Maori cemetery. We then retraced our steps back to Mapoutahi,where we planned to have lunch. This plan was quickly abandoned,as the incoming tide was threatening our route back to the cars. We eventually had lunch on the beach near Doctor’s Point. 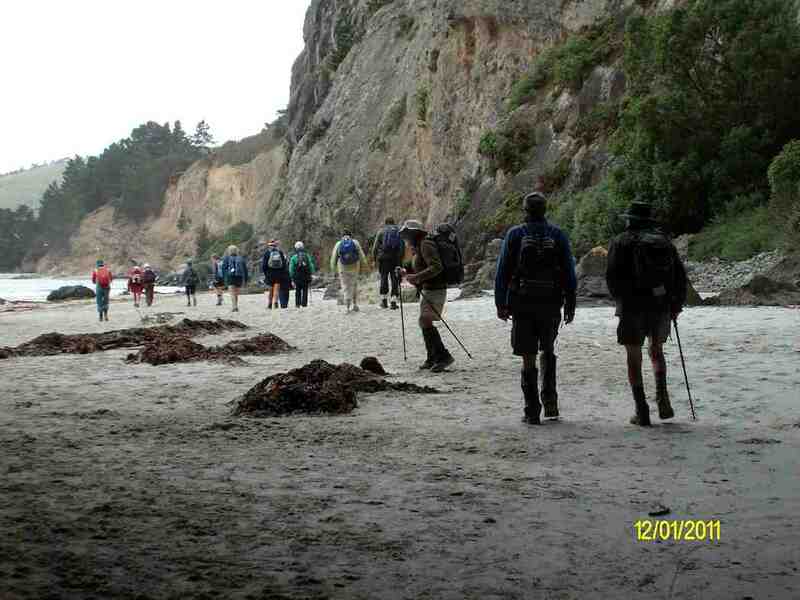 Time and tide wait for no Hikers!!! – Peter B. 19. 2017 Jun 21. Hikers. 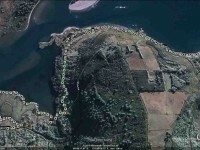 Orokonui Estuary & Opeke Tracks. E. Leaders: Lesley and Bev. 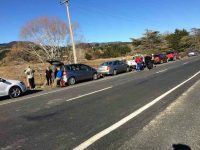 On a cold, frosty but rather dank morning 27 keen hikers parked their cars at the parking/picnic area on Orokonui Rd., where the Estuary track starts. From there we walked the short distance back. 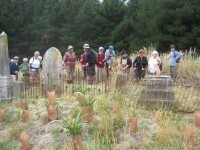 to the Waitati Cemetery where we had morning tea. 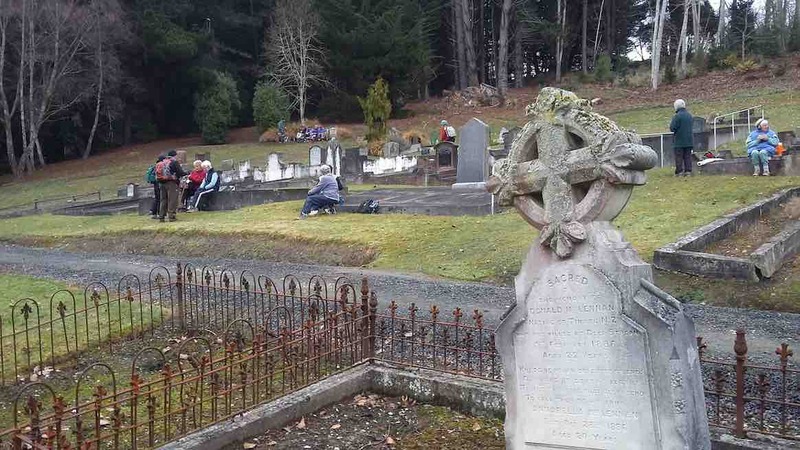 Quite a few people hadn’t been there before so were interested to have a look around the graves. As it was rather cold though we didn’t linger too long. 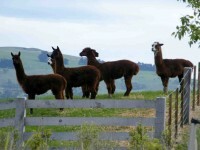 On down Orokonui Rd. till we reached the little bridge crossing the Waitati river which brought us out onto Killarney St. at the end of which was a new bit of track with some board walk coming out onto Doctors Point Rd. From there it was along the road till we reached the far end of Opeke track. 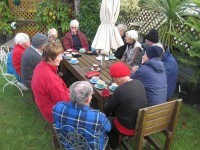 By this time we were all feeling somewhat warmer after a reasonably brisk walk. 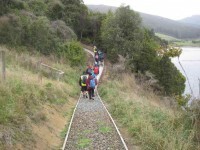 Then it was down onto the Opeke track. 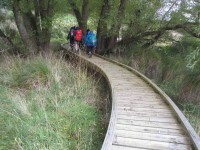 This is a very attractive and interesting walk which gives pleasure to the many people who use it. Locals and visitors alike. 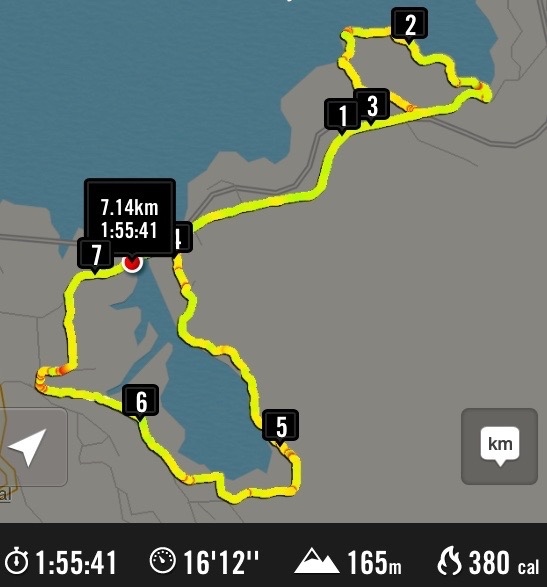 Near the end of this track is a short detour into an area that has some seats and great views across Blueskin Bay to Warrington and the other side of STH 1. Ideal for our lunch stop. 18. 2016 Aug 31. E. Hikers. Orokonui Inlet Track via Orokonui Ecosanctuary exclosure fence lower gate. E. Leaders: Leslie and Bev. 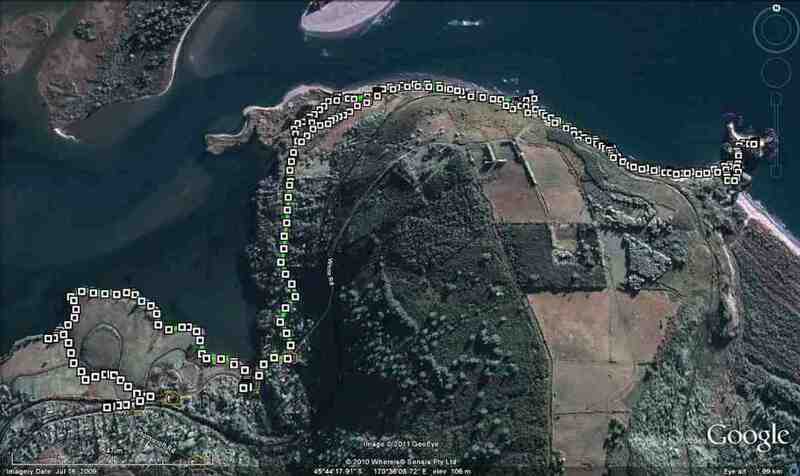 Hikers’ route map around Orokonui Inlet. Nike app updated again. To get all the goodies in, had to save it in landscape, rather than portrait. 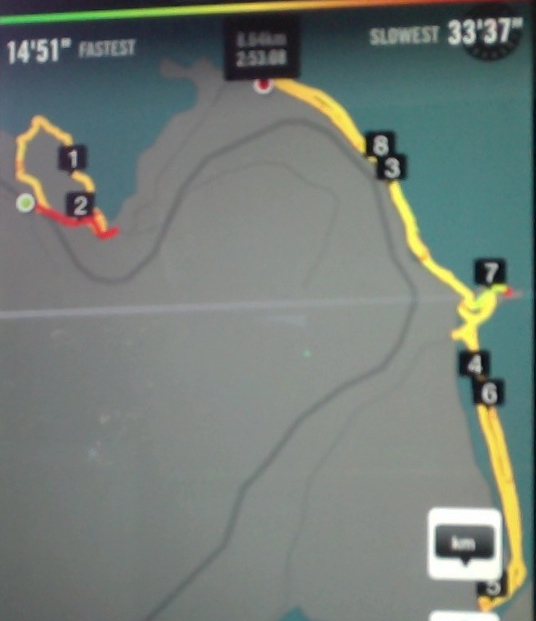 The “55.55′ is the elapsed walking time spot since start. Altitude and speed indicaters now seem accurate. 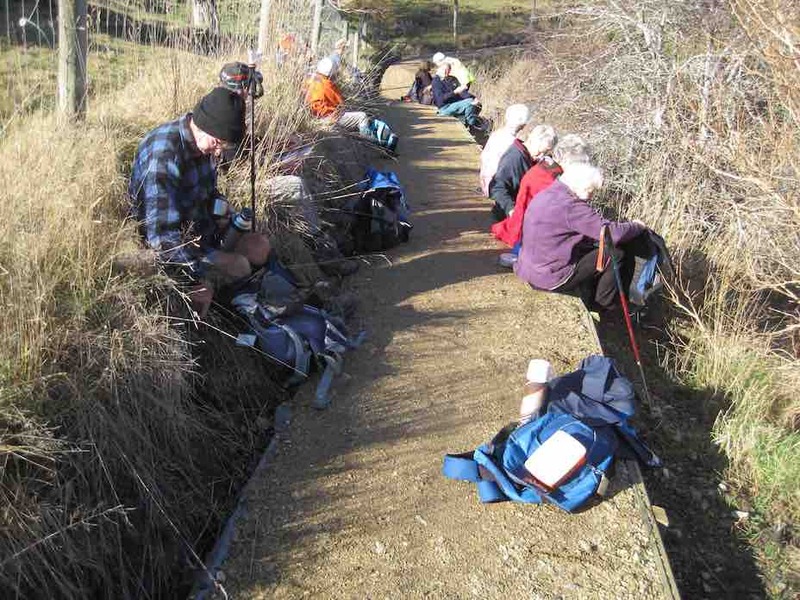 Lunch spot beside Ecosanctuary fence. 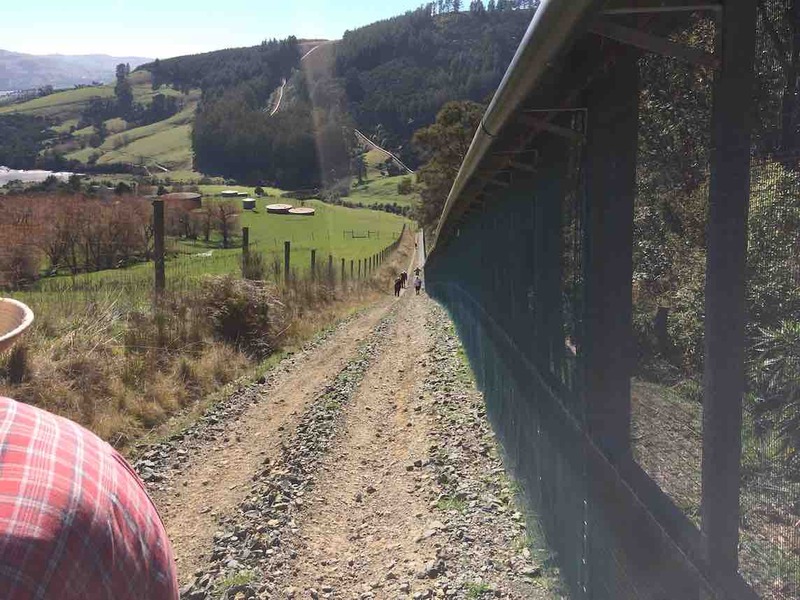 View from further up along fence. 17. 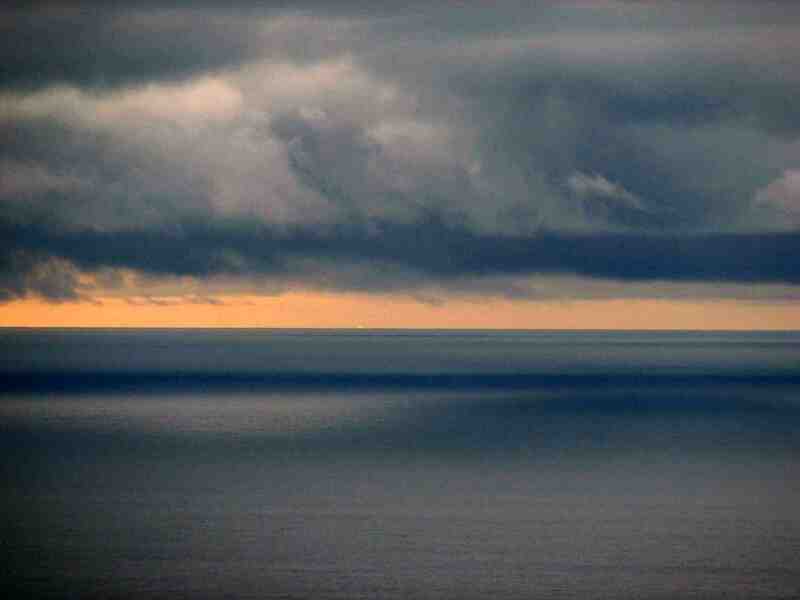 2015 Jul 22. Hikers. 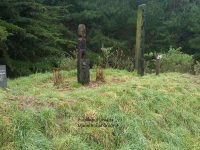 Opeke and Orokonui Inlet track and back blocks of Waitati. E. Leaders: Lesley and Bev. 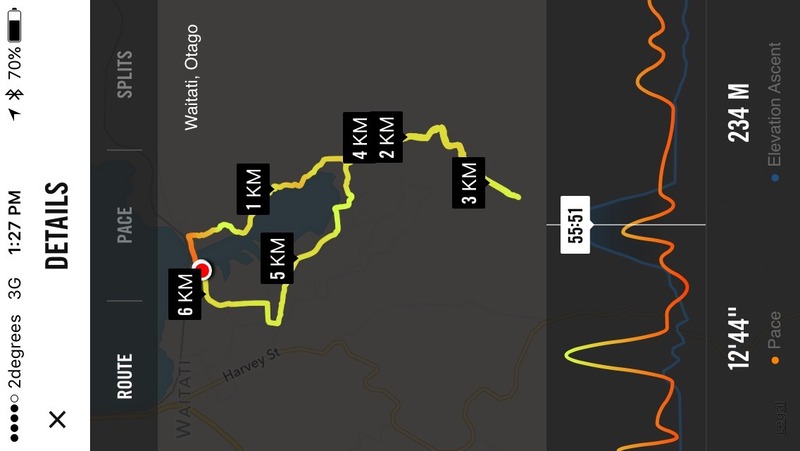 iPhone route map of Opeke and Orokonui Inlets. What to start off with? Well, two things, actually. We are suffering a barrage of birthdays presently. Adrienne had a big one last Wednesday, Dorothy anticipates a bigger one next week and Ian a small one a few days ago. And the other? Maybe a record? 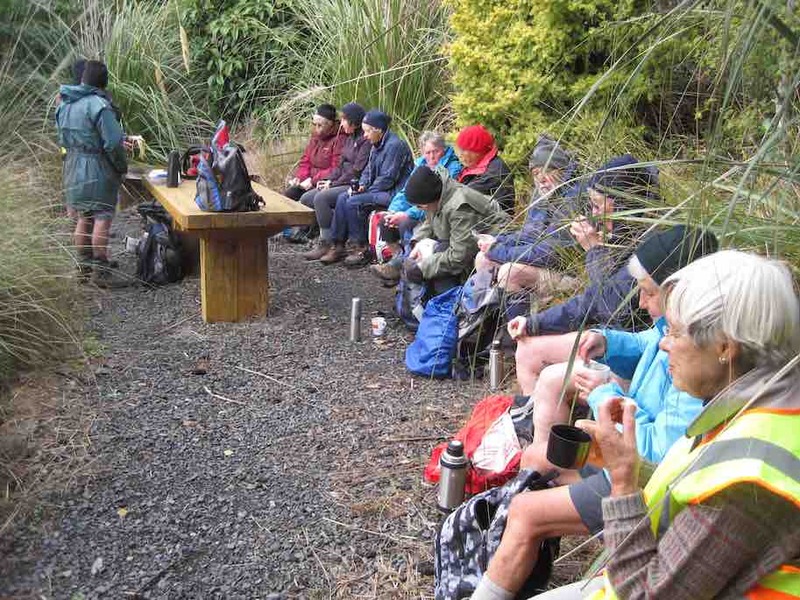 A full twenty of the twenty-four hikers of the day socialised for coffee later. A beautiful Birthday Card, crafted by Pam and signed by all present, was presented to Dorothy, who responded with a most pretty speech. Tramp matters. The day was calm and got really warm. 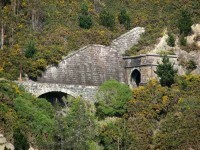 Many who hadn’t been on the last visit to Opeke were struck with the embellishments added to the trackside. The CAR, and small limestone carvings to mention only two. 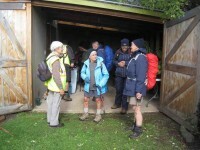 We had parked at the bridge and road-walked between Opeke and the Orokonui Inlet Track. 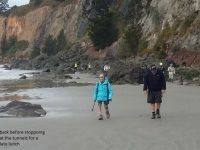 Click here to watch a video John took of us entering the Orokonui Walking Track off Chelivode St.
… before emerging onto the Doctors Point road and returning to the cars. 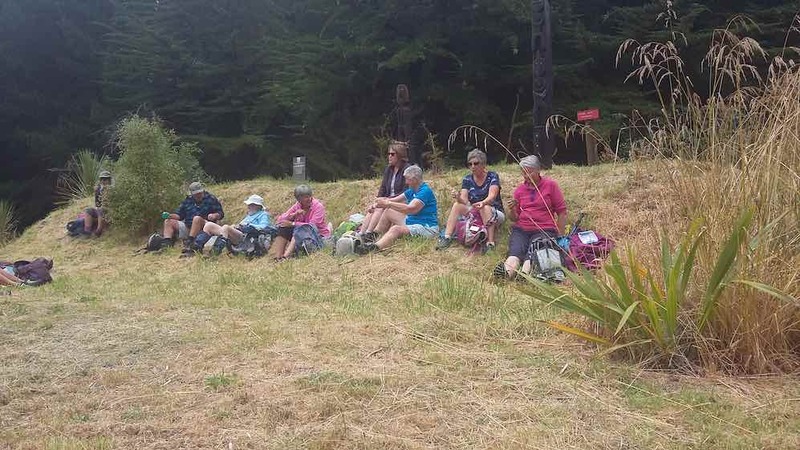 Lesley and Bev had picked on doing this trek again, foregoing the earlier swap plan of exploring the Old Waitati Road area due to his colder shadiness under the hill. 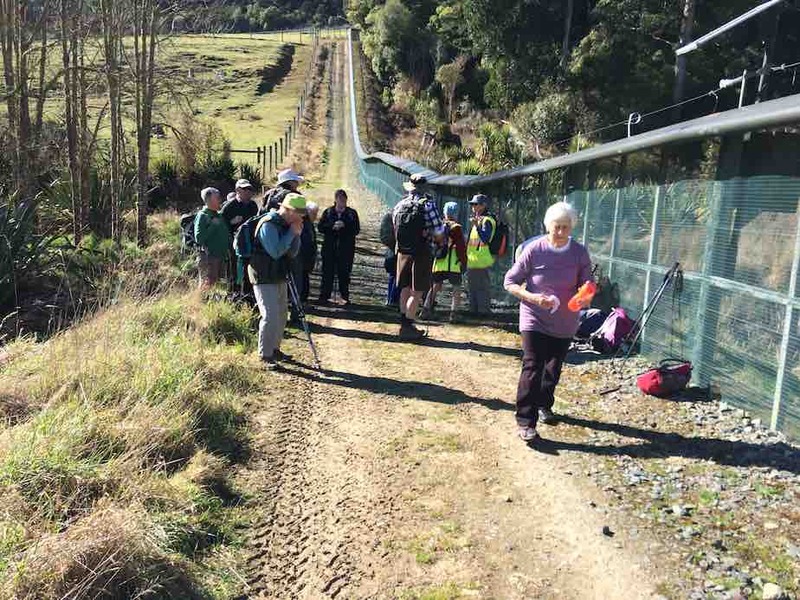 So thanks to Bev and Lesley for opening this newer area to even more Hikers. – Ian. 16. 2015 Apr 15. Hikers. 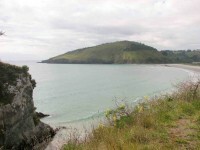 Orokonui, Estuary and Opeke Track. E. Leaders: Bev and Lesley. ‘Twas a cold and windy morning – the sane ones stayed in bed. But fourteen hardy hikers, bravely out were led. They didn’t fancy wet feet, I can’t imagine why. Instead, the estuary beckoned, with better shelter there. 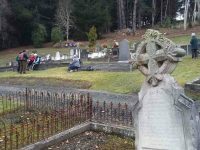 With coats and hats and gloves on, they didn’t have a care. 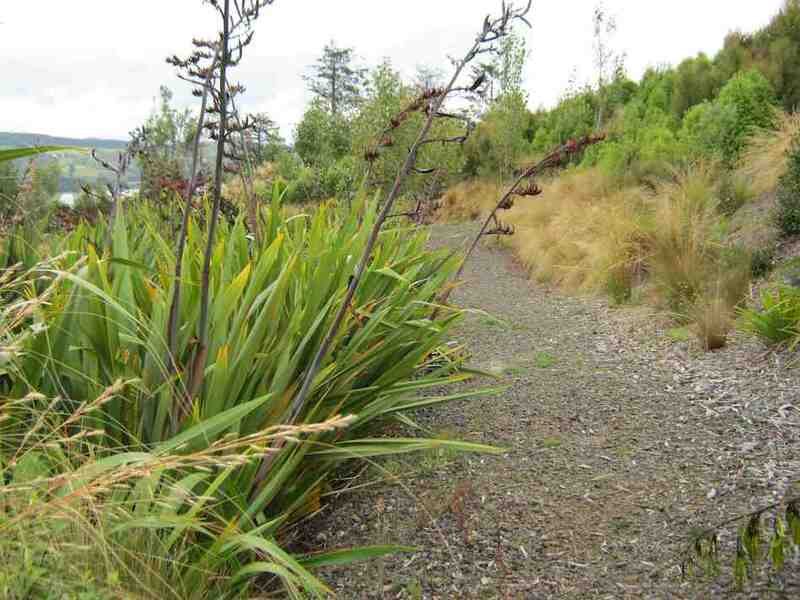 The track was easy walking, through bush and flax and trees. 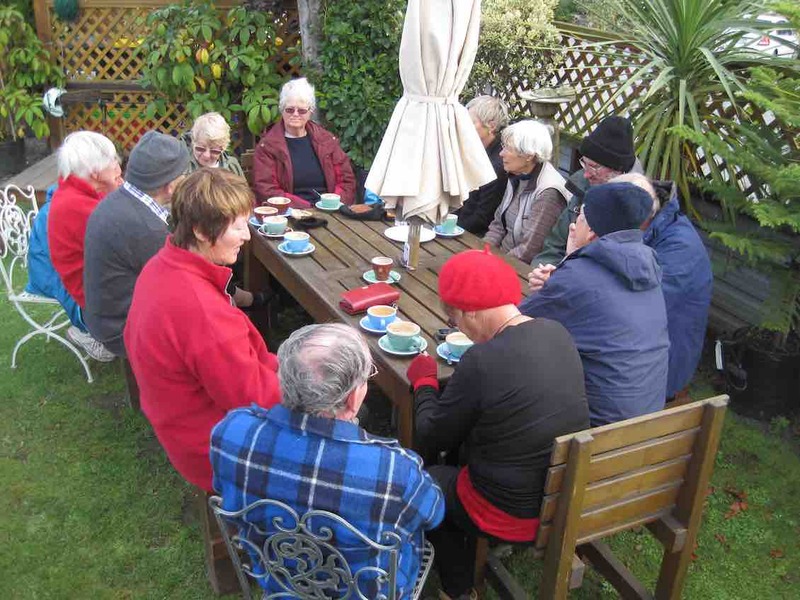 They lingered over morning tea, sheltered from the breeze. A grassy bank was found for lunch, it wasn’t even wet. John took lots of photos, you’ll see them on the net. 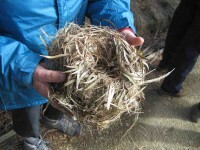 Leslie found a bird’s nest, she took it home to keep. (I hope the birdies last night, did find somewhere to sleep). Joined by Jim and Betty, who didn’t do the walk. With satisfaction they went home – It was a lovely day. 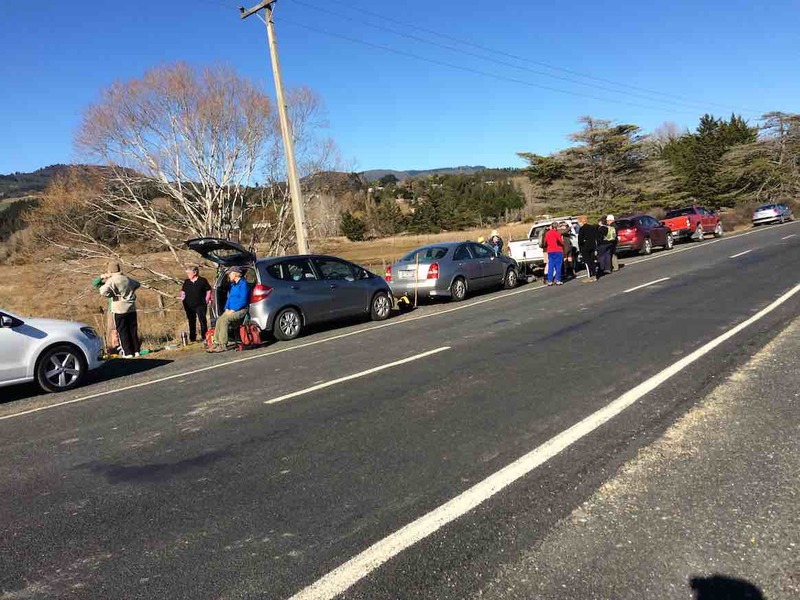 On a day when only heroes and the mad go out, we found the Waitati Stream at the foot of the Waitati Valley Road too full to attempt the intended crossing. 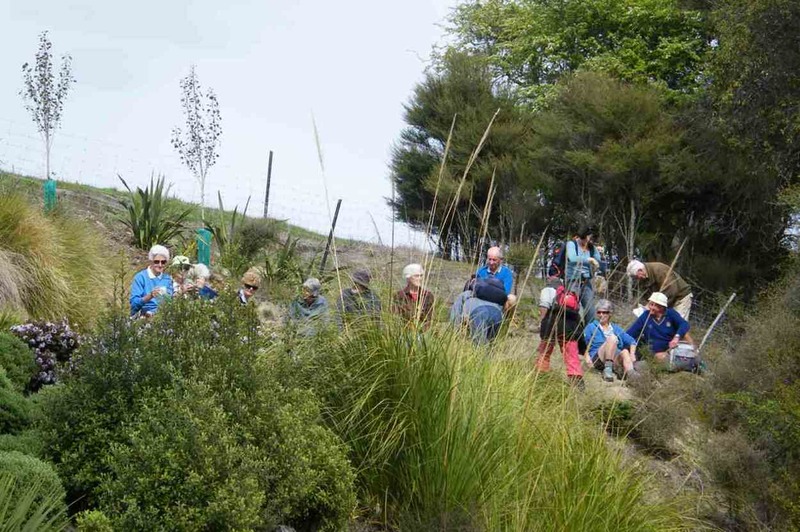 So leader Leslie, who with Bev had already recceed the above Orokonui Estuary walk set for later in the programme took fourteen of us on a route more suited to the day. 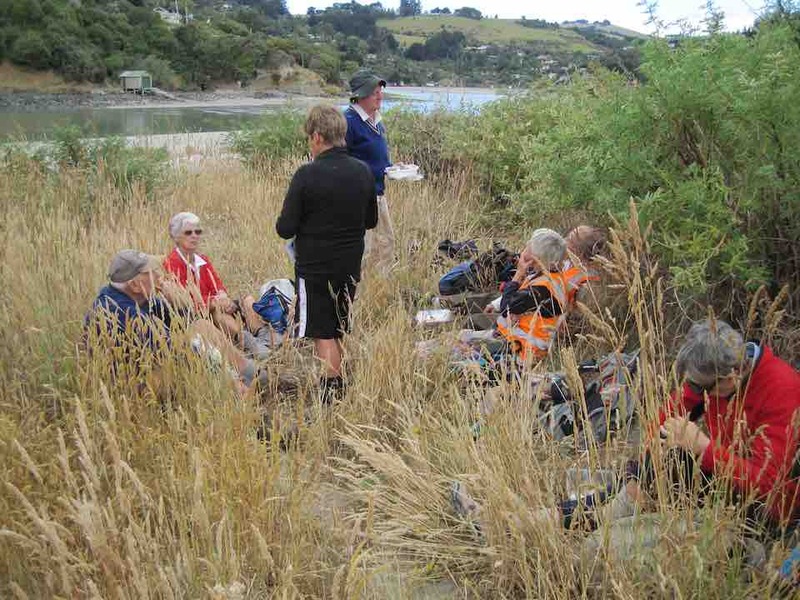 We parked at the Estuary bridge and set off, well-clad in storm gear, to the Opeke track’s northern entrance for morning tea at the lovely setting of table and seating near its entrance. Fortunately although windy, (and here we were well sheltered) the day was dry. 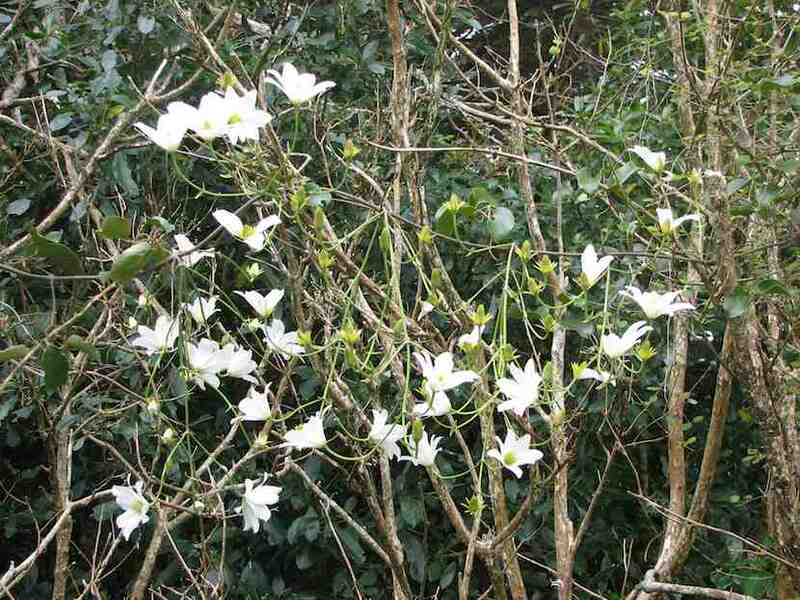 …tied down and waiting to be wreathed in nature’s verdure – apparently! 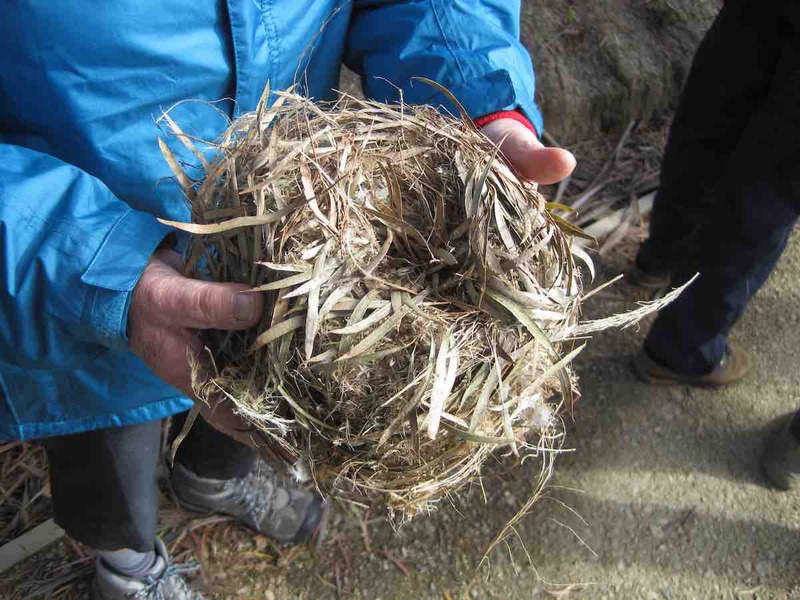 Trekking back from Opeke, we turned off just short of the bridge up Chelivode street, passed a hay-baled house, and turned down a newly-made track to skirt the side of the Orokonui Estuary. 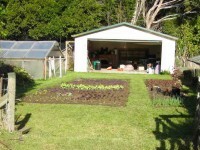 …to reach the back yard of a number of farm sheds accessed from Orokonui Road. 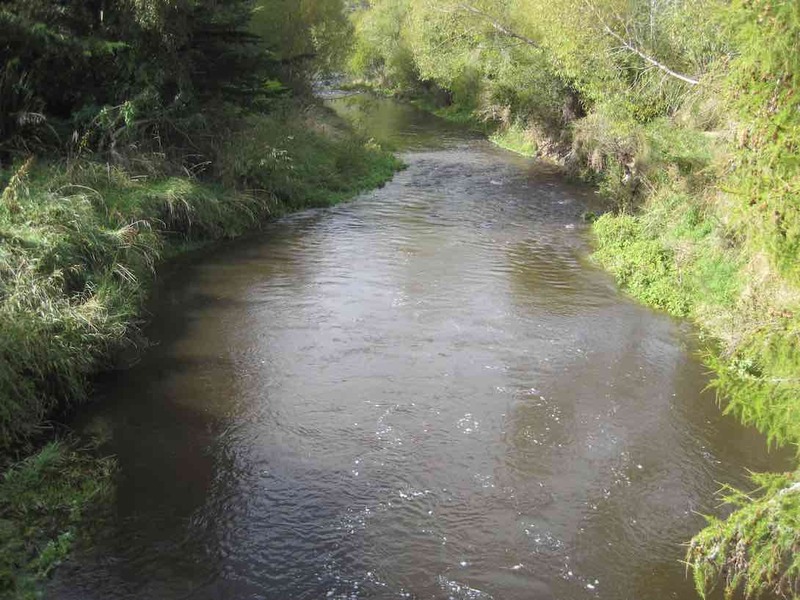 The track diverted down around a paddock or two to soon parallel the Orokonui Road on one side, and a heavily swollen Waitati Stream on the other. We lunched on a now sunny bank, still clad however in our parka-covered woolly underlays. …- all 14 of us, augmented by Jim and Betty who turned up. 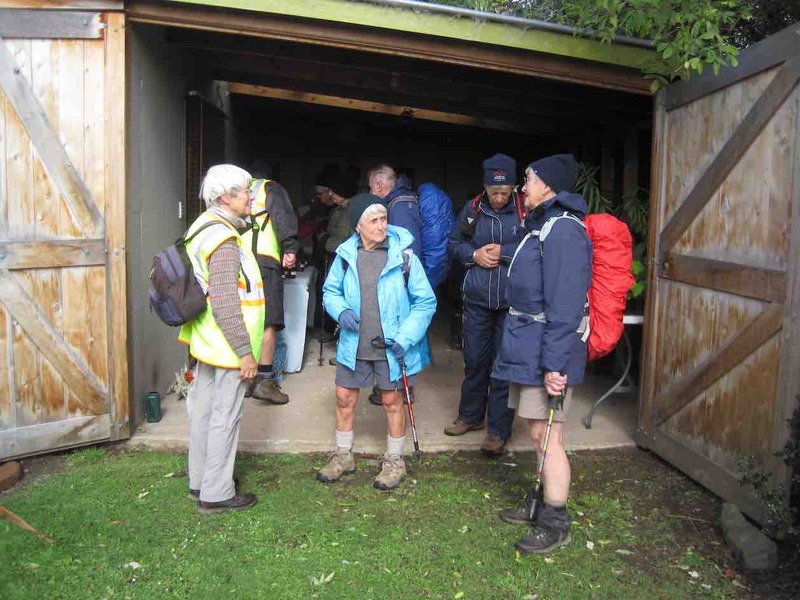 Thank you to Lesley and Bev, ably supported by back-marker Bob keeping us safely together, for devising such an appropriate alternative for such a challenging day. – Ian. 15. 2015 Jan 21. Hikers. Doctors Point. Mapoutahi Pa, Forestry and Urupu, return. E. Leaders: Jim and Betty. 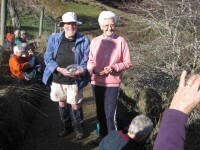 Jim and Betty, who had been allocated leadership the last three visits to Doctor’s Point, gave the trip an original twist, – by dint of three recces to get matters precisely aligned to the tide. They led 29 of us to the Mapoutahi Pa site for the tea break. Via the beach beyond the peninsula we turned off into the FWD through the sandhills, past the cliffs and on to the beginnings of the road proper, at the corner of the forestry. Here Jim opened the gate and led us past the following sign. 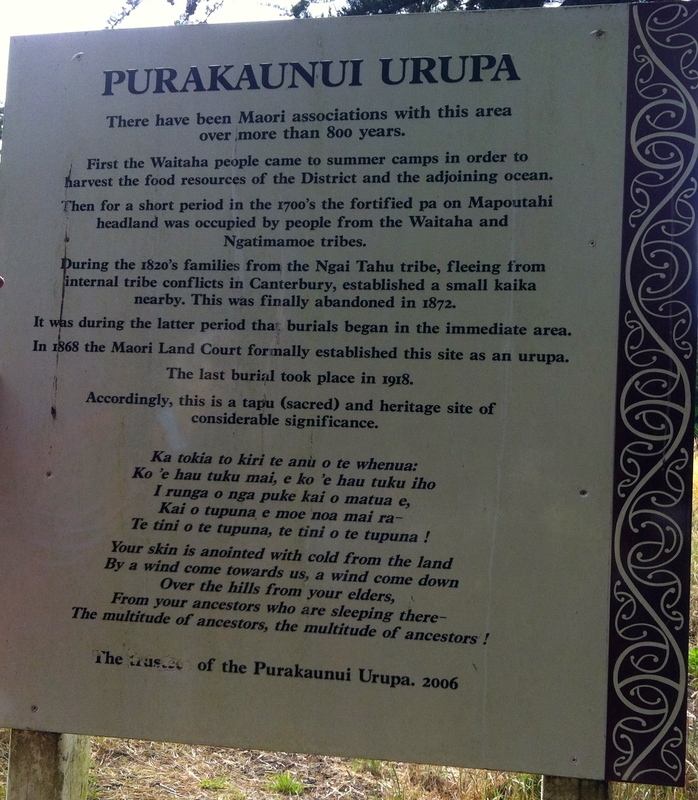 Purakaunui Urupu notice at forestry’s entrance. 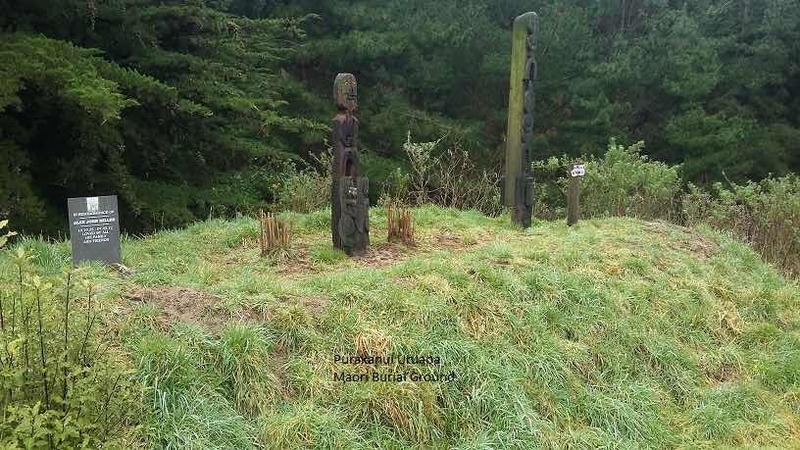 Another FWD track led us a considerable distance through the forest to terminate at a historic Maori graveyard. Betty and Jim then led us on through the forest by a route that they had previously explored and marked (well done!) 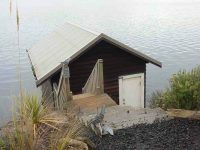 to take us out to the inlet’s entrance, where there was quite a cold wind persuading several to don more protective garments. Only a little way down towards the beach Jim let us into a well-sheltered spot amongst Marram Grass for lunch, where a warm sun persuaded garment-offing again. 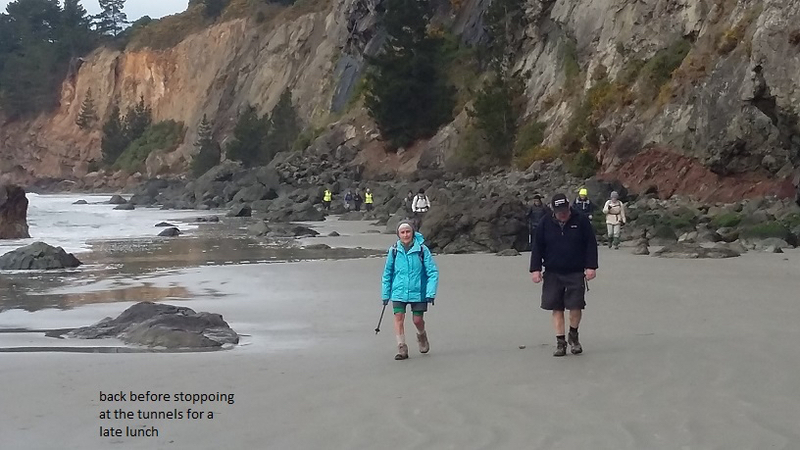 The return walk along the beach took us over the neck of Mapoutahi Pa peninsula to happily reveal that there was still a stretch of navigable beach at the bottle-neck by the rockfall not yet swallowed up by the incoming tide. A walk back to the cars ended a most satisfying day, with all of us congratulating and thanking Jim and Betty for the quality time they invested into their recce. Thanks to them here, too. – Ian. 14. 2014 Mar 19. 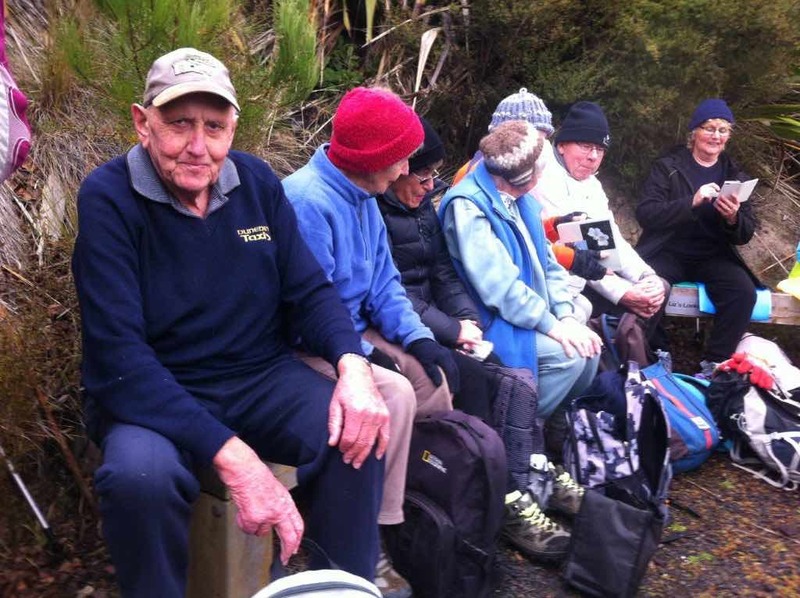 Hikers/ Waitati, Opeke Walk, Doctors Point, Mapoutahi Pa, return. Leaders: Arthur and Barbara. This must be our most popular tramp, as we schedule it about twice a year. 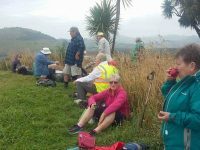 This time Arthur and Barbara gave us the full Waitati to Mapoutahi Pa road and beach walk, with Opeke for morning tea in between. 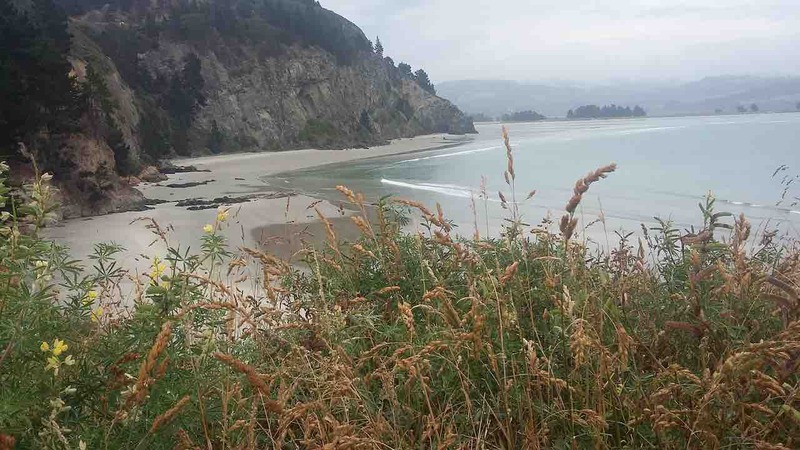 The very low tide gave us the largest beach expanse this reporter has ever seen. The sea mist spoilt views but cleared just enough for us to glimpse the rail tunnel from the peninsula. 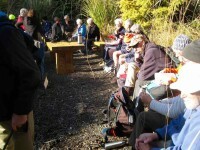 The near record of 30 of us included three new members and one visitor. Thank you Barbara and Arthur for your good careful leadership. – Ian. 13. 2013 Oct 9. Hikers. 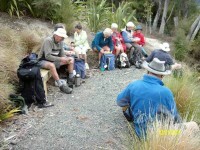 Waitati, Opeke Walk, Doctors Point, Purakaunui inlet, Mapoutahi Peninsula. Leaders: Jim and Betty. 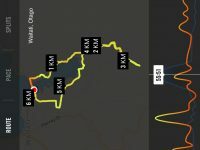 GPS of routes. First Opeke Walk. 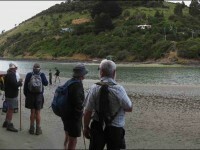 Second Drs Point to Purakaunui Inlet mouth, return, 8.53 km total. 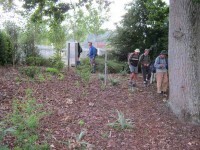 We parked the cars first at Michies Crossing, and walked across the lineto immediately go down into the Opeke reserve. 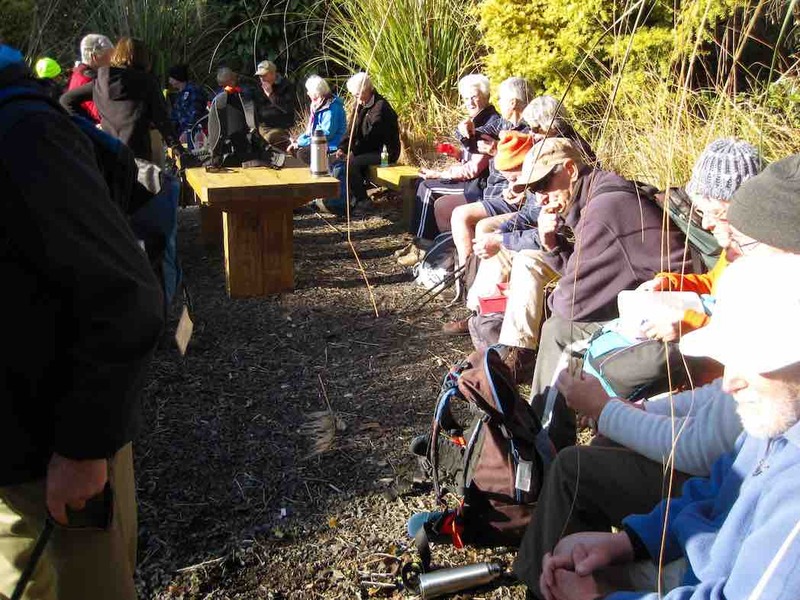 The flax had been trimmed and we made a leisure stroll down, around and up again to stop for morning tea at the wonderfully arranged table and seating, accommodating all twelve of us. Then it was up and out the gates at the far end and back along the road to the cars. 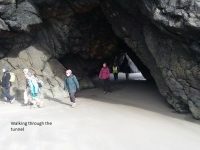 We drove on down to Doctors Point now, and walked along the beach, left hard and smooth by the outgoing tide, through the caves, past the rock fall and onto Canoe Beach, well identified by a surf canoe which had just drawn up on the sand for the rowing couple to take a rest. 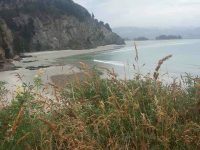 We went right past the Mapoutahi Peninsula and on to the Purakaunui Inlet mouth, only to be met by a fierce cold wind blowing down the inlet. So we didn’t wait too long before getting back around the corner and into the shelter of the forestry and sandhills. This time we stopped at the peninsula for a calm sunny midday lunch. 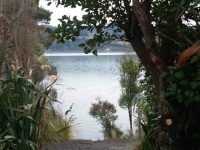 This time we were able to watch the canoeing couple returning along beyond the surf to Purakaunui, just able to make out the yellow of the canoe as they dragged it up along the side of the inlet mouth against the outgoing waters. We then just strolled back to the cars, given plenty of space by the 12.30 p.m. low tide. It was good to have ex bus-driver Bob Mitchell with us for the first time as an full club member. Jim and Betty of course guided and shepherded us along with their usual care and made the day an enjoyable outing for us all. – Ian. 12. 2013 Mar 20. Hikers. Waitati, Opeke Walk, Doctors Point. Leaders: Jim and Betty. Morning Tea break near Opeke Walk entrance. 11. 23/1/2013. Hikers. 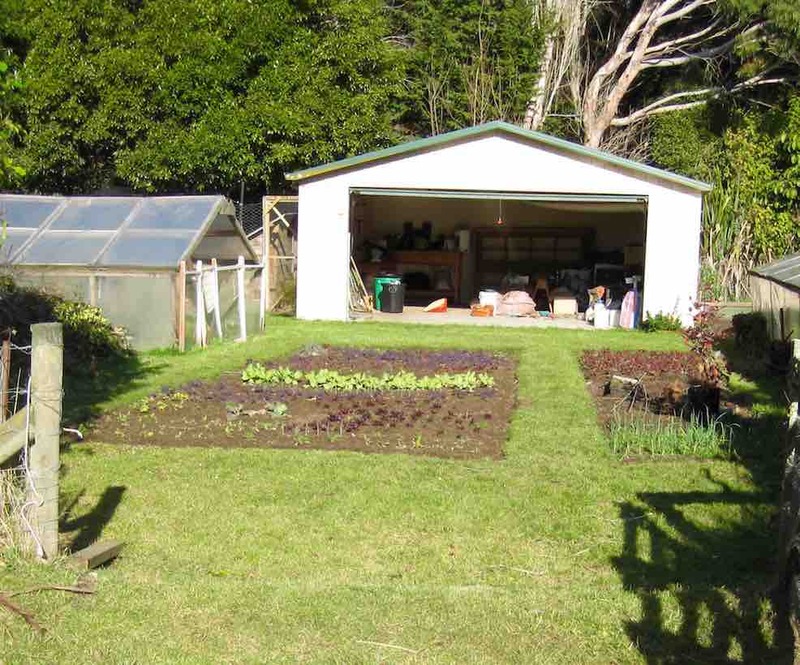 Donald Rd, Murray Rd, Waitati Valley Rd, McIntosh Rd. Easy. Leaders: Lesley, Bev. 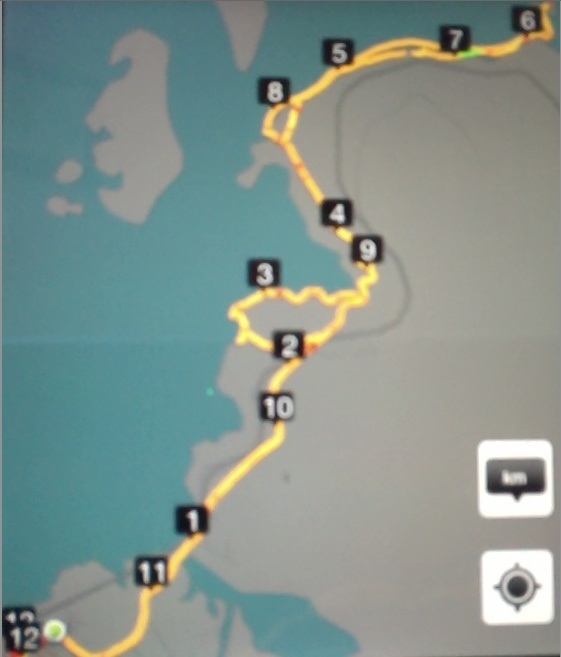 Route map from iPhoto. 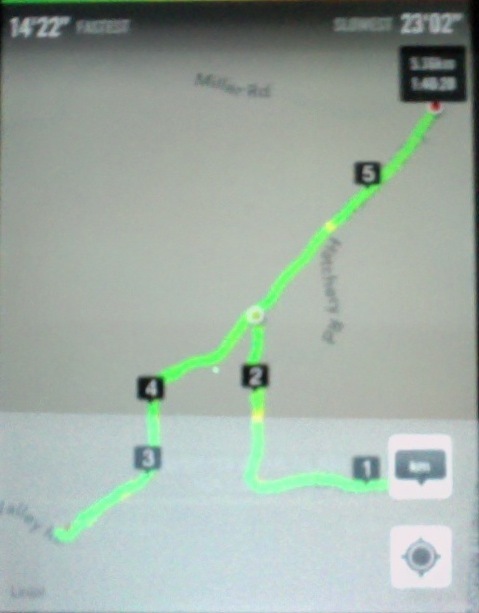 (Omits Murray Rd altogether and begins a little time after we left the parked cars when I thought to turn it on). Numbers indicate kms in sequence. 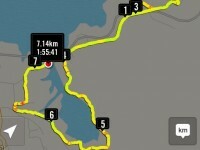 So real distance was nearer 7.5 kms. 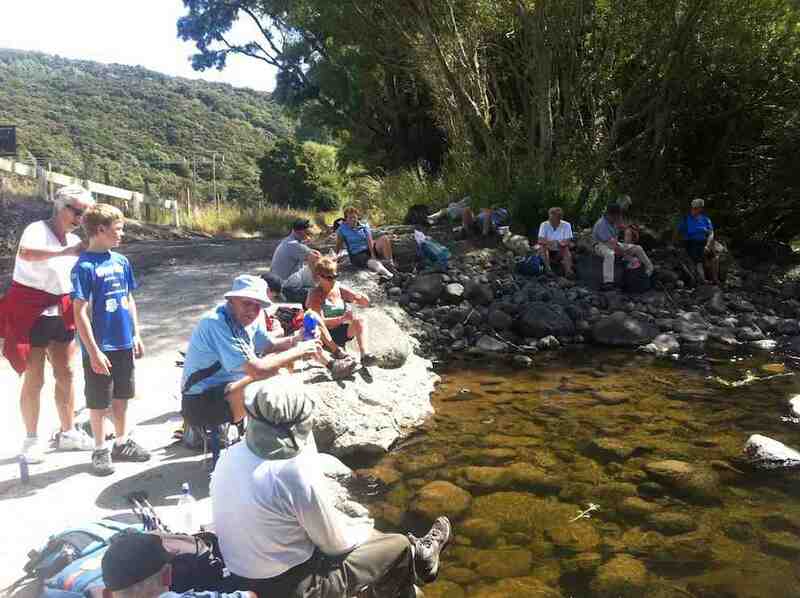 Early lunch on McIntosh Rd bridge over Waitati Stream. 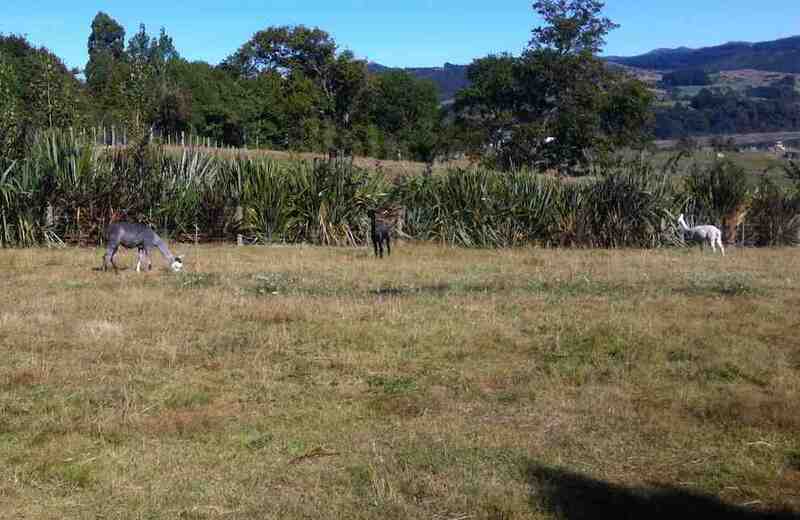 Lesley was brought up by the old YMCA camp on the Waitati Valley Road, which area we walked past. So she was able to tell us all about the Trout Fish Hatchery and the original and later houses her parents lived in. 10. 12/1/2011. Both. Picnic Lunch. Opeke Walk, Doctors Point, Mapoutahi. Leaders: Bob and Evelyn. Bob and Evelyn had us first park at Opeke reserve. Coming through Willowridge’s Opeke reserve upper entrance. Not the best example of how the claddy flaxes now overhang the track. 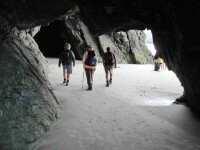 We returned to the cars and drove on to Doctors Point and walked along to the cave. 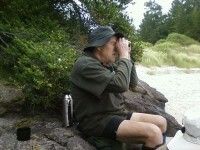 After lunch on the peninsula’s beach, Ken, through a monocular, studies some further club members, who after lunch, were now also tackling the rocks. (Bob pic). 9. 2010 Sep 29. Hikers. Doctors Point. E. Leaders: Barbara, Fred. 8. 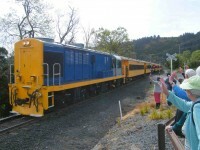 2009 Apr 8. Combined. 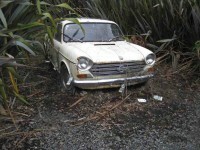 Waitati, Willowridge, Doctors Point, caves, ret. Easy. Leaders: Arthur and Barbara. Waitati at the start. Arthur, Barbara, Margaret, Bev, Carmel, Angela. We start the Willowridge walk. Carmel, Neil, Bev, Margaret, Barbara. About to have a break. Angela, Peter, Arthur, Elaine, Barbara. We survived the occasional shower passing over and enjoyed just being out. The shelter of the caves was welcome. 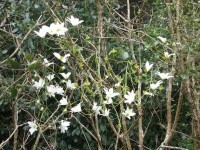 A flighty fantail flock fluttering in the rocks overhead added interest as we lunched looking out to sea. Excitement rose as towards the end of lunch the incoming tide grew too incoming and prompted a prompt departure. Lunching in the caves. Arthur, Bev, Barbara, Angela, Margaret, Carmel, Elaine. on some of the many seats also ‘planted’. A tremendous development we all thought. We cheerily waved to the travellers on the Taieri Gorge Rail trip to Palmy as we waited for safe passage at Michies Crossing. Thence onto the beach, along the estuary, through the caves, past the cliffs, up onto Mapoutahi Pa site where we lunched with great views and enjoyed the usual banter. Some stayed on the beach fearing that the tide was going to turn too quickly for our retreat, but in fact no one got wet feet (well, Pat, you were marooned on a rock for a short time) (and there was a wee wave), and we returned to the cars by the Doctors Point road. 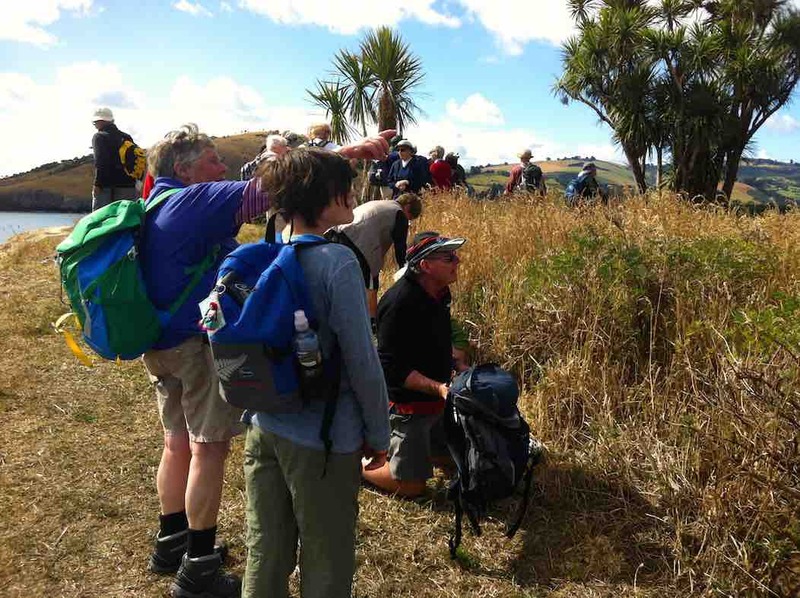 The weather was calm and mild and we had enjoyed the great variety of scenes on the 14km journey. – Bob M.
Evelyn and Bob led our first tramp of 2008. 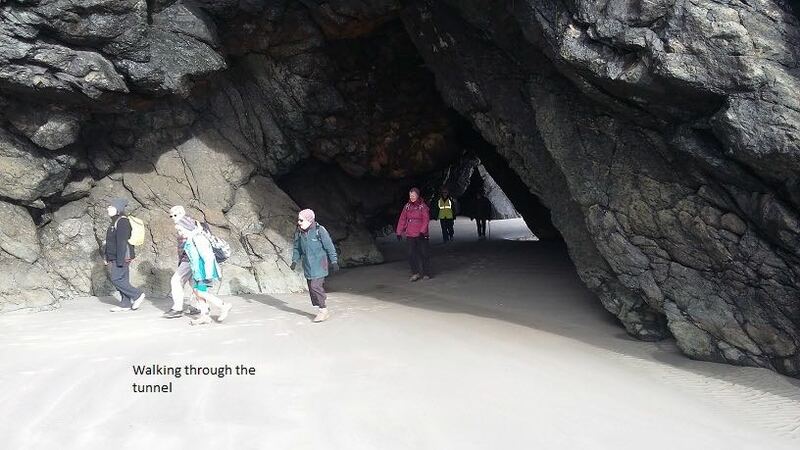 It was an easy stroll on a fine day, walking through the cave at Doctors Point at low tide to stop at Mopoutahi Peninsula former Maori pa site for morning tea. 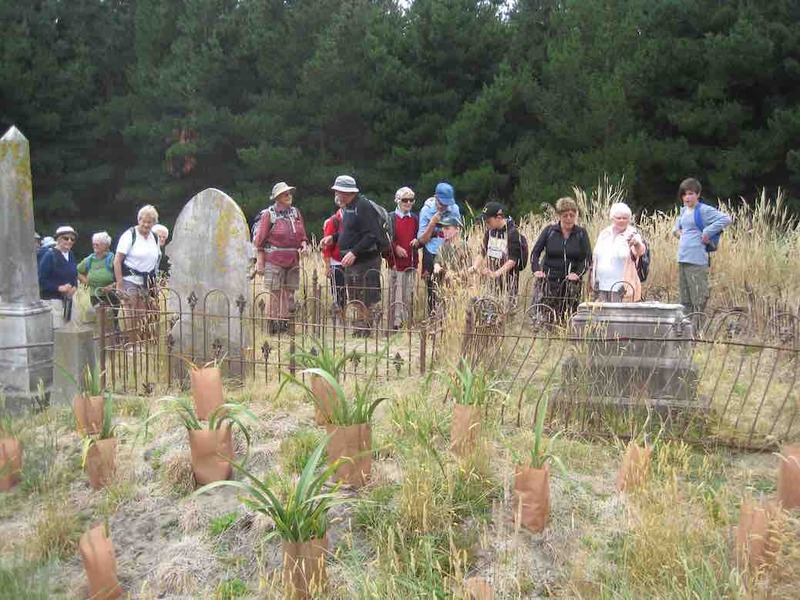 Evelyn explained the usefulness of the cabbage-tree (of which there are many there) to Maori for food, although no umu-ti – cabbage-tree ovens – have yet been found on the peninsula. 5. 2006 Nov 22. Doctors Point. 3. 1997 Sep 24. 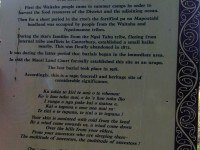 Waitati, Doctors Point. Leaders: Shirley McN, Daphne, Pat. 1. 2008 Jan 9. Both. Doctors Point, Mapoutahi Pa. Easy. Leaders: Bob and Evelyn.